The Legend of Zelda has always been a series known for its careful attention to the details of its world and characters, and that couldn’t show more than in its copious implementation of Easter Eggs – little secrets that longtime Zelda and Nintendo fans will catch and appreciate. 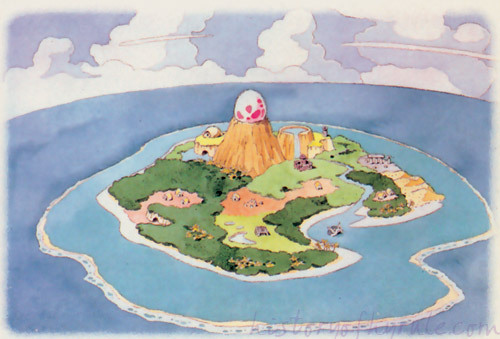 We’ve seen enemy cameos in A Link to the Past and Link’s Awakening, an in-game “Game Boy” in the form of the Tingle Tuner, and even an island shaped like a giant DS system in Phantom Hourglass! There’s no denying that this series knows how to do Easter Eggs right – but which ones are the most legendary? There have been millions of Zelda fans over the years, but so far only one has earned the ultimate honor: a cameo appearance in an official Legend of Zelda title. That fan is Chris Houlihan, winner of a Nintendo Power grand prize drawing held back in the A Link to the Past days. He received a small mention via a telepathic tile in a top-secret hidden room in the game’s U.S. Release. One of the coolest secrets in Ocarina of Time was the hidden art gallery in the Hyrule Castle Courtyard where you meet Princess Zelda. If you peered through the right-hand window, you could catch a peek at paintings of Mario, Yoshi, Princess Peach, Luigi, and Bowser. Of course, if you were feeling a little mischievous you could also fire a bullet from your Slingshot at the window to cause a 20 Rupee piece to appear! 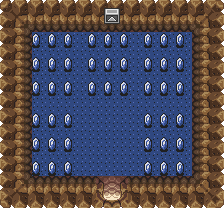 This is one of the most famous Zelda Easter Eggs of all time, so here’s hoping they’ve retained it in the 3DS remake. 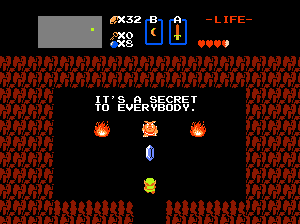 The original Legend of Zelda was famous for its often shoddy translation jobs, which yielded such classic phrases as “It’s dangerous to go alone,” “Dodongo dislike smoke,” and “Spectacle Rock is the entrance to Death.” Perhaps the most enduring of these was the line “It’s a secret to everybody.” This moment was already odd enough since it involved Link getting free money from a friendly Moblin who lived in a cave at the bottom of a secret staircase, but it’s the awkward phrasing that made its way forever into the annals of Zelda lore, garnering all kinds of references both within the Zelda series and in various other media. The Wind Waker began with an interesting introductory crawl, showing off some really neat antiquated-looking scrolls detailing the trials of the Hero of Time. These scrolls were decorated with a ton of Hylian flavor text – but upon closer inspection, these writings weren’t just for looks after all. Japanese players received a translation guide for the characters, which actually correspond to letters in the Japanese kana (alphabet), and with their help it was possible to fully interpret the intro legend. It told basically the same story as the intro text, but in much greater detail. Long ago, it was said that there was a country chosen by the god’s power. The people who lived in this blessed rich land were called the Hylians, and were said to be able to hear the voices of the gods. They, together with the people of the plains, the people of the mountains, the Gorons, the people of the water the, Zora, the people of the desert, the Gerudo, and the people of the forest, the Kokiri, all carried out unique lives. Even in this rich land, the footsteps of destruction began to creep in. The Evil One seized the power of the gods, and wrapped this land in evil, and the once beautiful land fell into ruin. It was at that time when it happened. A being clad in green appeared out of nowhere, and, granted with the power of the gods, defeated the evil power at the end of a furious struggle. Peace had been returned to the land. It is said, having appeared by crossing time this person was called the Hero of Time, and became a legend in the kingdom. A time later, the kingdom that had been thought to have had its peace returned, again, had dark clouds standing over it. The one who held the evil power, who had been thought to have been sealed forever by the efforts of the hero, revived with no reason. Though the people waited eagerly for the hero of the Legend to once again appear, the hero had put the country behind him, and journeyed into the flows of time, and never appeared. With no one to protect them, evil began to draw near even the royal palace. The people, finally entrusted the fates of the entire land into the hands of the gods. Many years have passed since then, and the people who heard the words of this tale began to imitate the hero of legend, and are said to make a boy green clothes to wear as a celebration of his growth. I love Zelda trailer music, but this discovery made me appreciate it all the more. As we reported yesterday, Youtube user Fpawesome1 found out that if the Skyward Sword trailer track is played backwards, you’ll actually hear the iconic Zelda’s Lullaby instead. This has got to be one of the weirdest and most interesting series discoveries in the last several years, and so it’s definitely the prime choice for the top spot on my Top 5 Zelda Easter Eggs list. Take a listen to the track below, courtesy of Rawmeatcowboy at GoNintendo. Those are my favorites – what about yours? Share your favorite Easter Egg-related memories in the comments section and let your opinions be known!